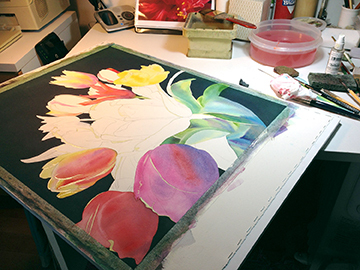 The 2016 Skagit Valley Tulip Festival poster has been unveiled so now I can share with you my process of designing and painting the artwork. The realism of all my Floralscape paintings starts with photography. I look for dynamic images that have color gradients that will be fun to paint with watercolor. 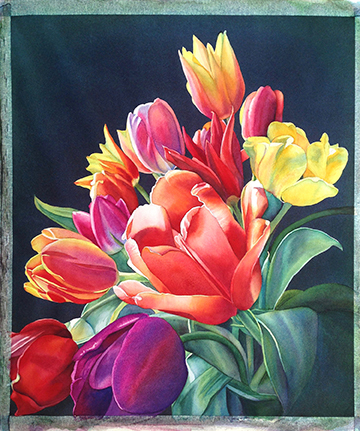 The festival committee wanted a bouquet of tulips rather than a close up of one bloom, which is more the focus of my art. 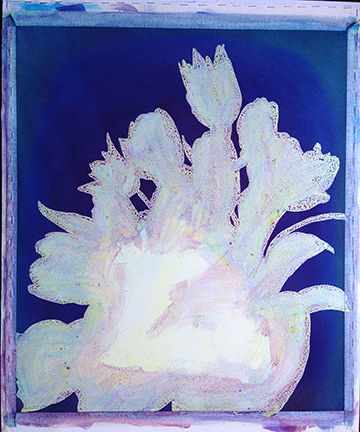 I like to find abstraction and lively design within the realism of a flower. This is the starting photo I manipulated for my desired composition that bursted into the picture plane from the side. I visited the Tulip Festival and RoosenGaarde Gardens for inspiration then I purchased 20 different varieties of tulips at the Pike Place Market in Seattle and arranged and rearranged the bouquets, taking hundreds of photos to find a shot with one good featured close up of a bloom surrounded by an array of varying colors and types of tulips. I added in several flowers and leaves in Photoshop and moved around others to create a tighter composition. 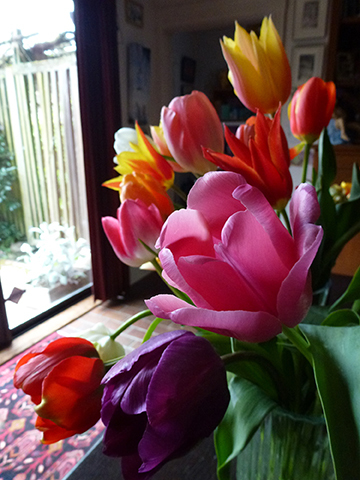 I also changed the large pink tulip to orange with the magic of photoshop to get my final reference photo. I prepare my Arches 140# cold press paper by soaking it to remove the sizing, making it more absorbant, and stretching it while wet by stapling it to gator board to help keep it flat and able to endure many wet washes of water and paint. I tape the edges to make a clean border. I transfer an outline of the composition to the paper where I’ll apply masking fluid to resist many layers of background washes as I try to build a colorful dark, smooth background color. The dark gives a very dramatic effect to the painting. Here’s the painting all masked and after several layers of color have been applied. 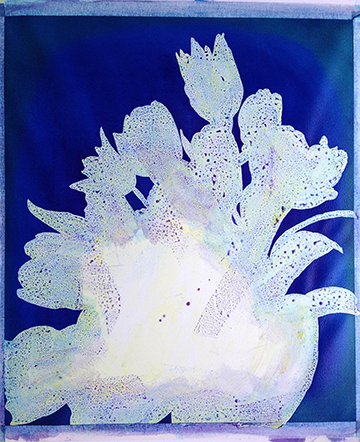 The mask, which has a yellow tint, protects the white of the paper where I want the colors to be lighter than the background and have the luminosity of the white paper glowing through. It allows me to be looser with the background washes of color. I do about 10 or more layers of colors allowing each layer to dry as I build and tint the background to a shade that I’m happy with. Here’s another view of building the background color with a rich layer of wet ultramarine blue over the teal and green. This color can separate into a granular texture allowing the colors underneath to shine through. The original painting is wider than the poster proportion and will be cropped in on the right. I was asked to complete some of the right side flowers beyond the crop for some of the other product designs of the final image such as T-shirts, cups and tiles. 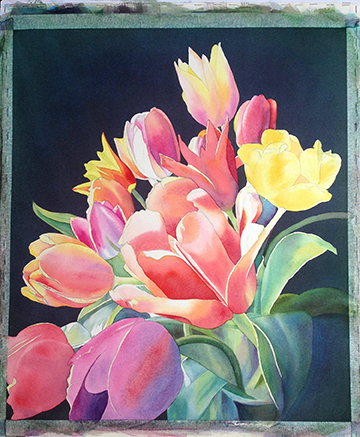 The corner treatment went beyond the poster cut off but was subtle and I still needed to be sure the background was best on the original painting, which is on permanent display at the Tulip Festival offices in Mount Vernon, WA. More colors added to deepen the darks. You can see the reds and purples added by the overflow into the masked areas. Warms and cools will mix to make a richer dark neutral tone. Lots of time is spent waiting for paint to dry to see what color is needed next. 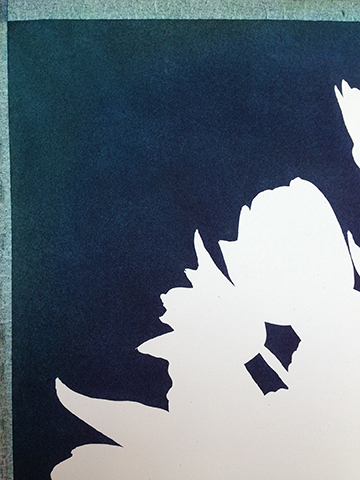 Here’s a close up detail of the final background color with the mask now removed from the bouquet. You can see the layers of color, dark but glowing. 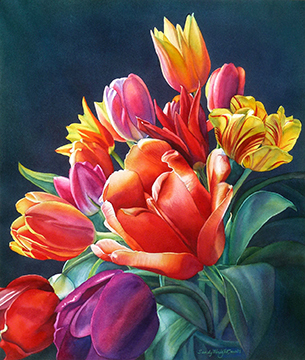 Complimentary colors were layered in to create a more neutral tone setting off the colors of the flowers to be the most vivid part of the painting. Next, I’ll draw in the contours of the bouquet shapes and will mask small details where I want to protect the white of the paper. Anytime mask is added, I have to wait for it to dry completely before painting over it. The painting is so large it spills over the side of my painting table. It’s painted on a full sheet of paper sized 22” x 30”. I’m starting to add in the under tones of the flowers and leaves. Each area takes 3, 4 or more layers to build the full richness of color, and depth with each shape drying before adding the next. This technique is called glazing. I try to get about 3 colors to intermingle in each petal, leaf or area. This is the fun part! The individual flowers are starting to develop now with rich layers of color creating more depth. Most of the masking of details have been remove and the edges softened to blend with the surrounding colors. Small, tight details are still needing to be added and refined and the leaves darkened to disappear into the background. Here’s the final painting with tape and staples removed, my signature added and ready to photograph and deliver. What do you think? If you are in the NW come visit me during the April weekends of the festival. I’ll be at RoozenGaarde, 15867 Beaver Marsh Rd Mount Vernon, WA on April 2, 10,16, 24 from 11am – 3pm. I’ll be at Tulip Town, 15002 Bradshaw Rd Mount Vernon, WA on April 3, 9, 17, 23 from 11am – 3pm. I’d love to see you if you can pry yourself away from the blooming magic in the fields and gardens. This is stunning!!!!! Thanks so much for sharing the process with us. Very nice beautiful selection of color. I love your work. Hope I can see you at the festival.